Which rodeo is your favorite? A fond farewell to Neal Reid, an introduction to Susan Kanode and a horse named Bling. I’ve been an avid reader of the NFR Insider for the past five years and have enjoyed Neal Reid’s insights, excellent reporting and writing. When Neal accepted the position of Media Relations Manager at Las Vegas Motor Speedway I was honored to be asked to fill in as the NFR Insider. While the paths that got us involved in rodeo are quite different Neal and I share some commonalities as well. We worked hard to earn journalism degrees. We appreciate good journalism and believe that integrity in reporting is very important. Most importantly of all, we are both rodeo fans and love sharing these stories. The horse quickly caught my eye. Bling is a small mare and is bay roan in color. Part of the reason she caught my eye is because I have been the owner of a small gelding that is similar in color for the past 10 years. 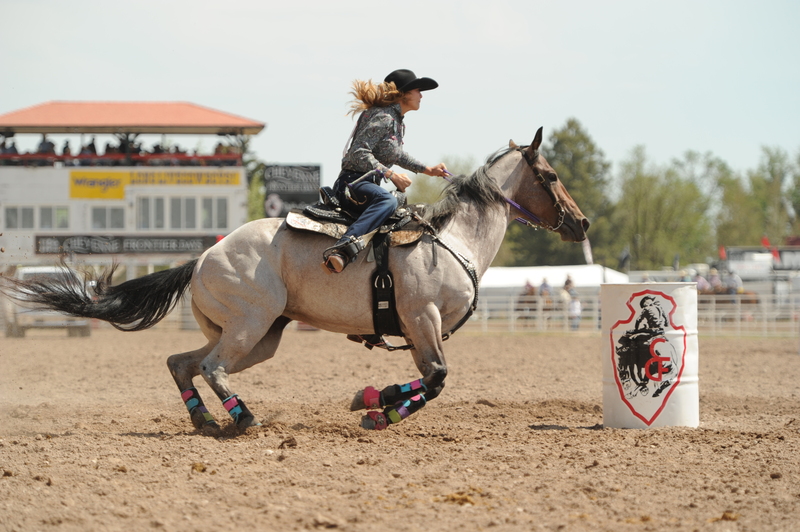 There haven’t been a lot of roan horses in the barrel racing world and that probably makes them even more memorable. And, while I am a barrel racing fan, I am certainly not an expert. When I watched this team work, I took notice. I saw the fluidity of the horse making her turns and this young women smooching and encouraging and just knew I’d be talking to her in the future. I couldn’t help but think about how far away from their home in Brunswick, Ga., they were or how different it must be to be competing in one of the largest rodeo arenas in the world. The traditions and history at Cheyenne’s “Daddy of ‘em All” are legendary and for many just competing there is a highlight of their careers. McDonald and Bling narrowly made it into the progressive round and got to make another run. While they were far out of winning a paycheck I still admired the grit and determination they had just to be there. Just days after Cheyenne, this duo set the arena record at Spanish Fork, Utah, with a 16.77-second run, nearly three-tenths of a second faster than that of Wrangler NFR qualifier Kassidy Dennison. That earned the Georgia pair $5,616 and confirmed that her decision to come “out west,” was a good one. Barrel racing fans across the country weren’t surprised at McDonald’s success while rodeo fans were trying to figure out just who she was. 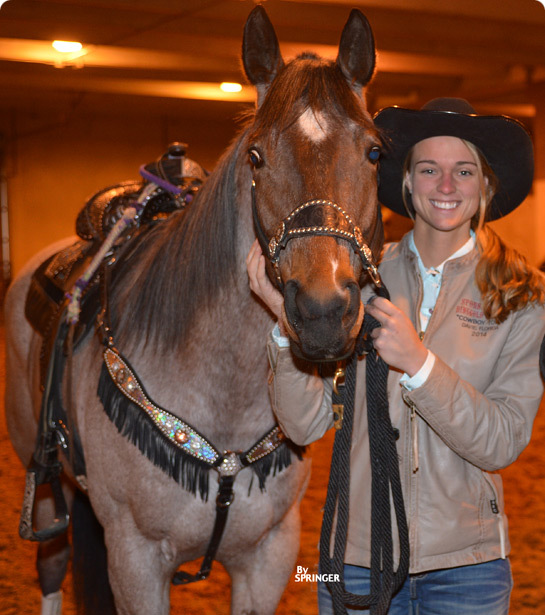 She and Bling earned a world championship in the National Barrel Horse Association where Bling was voted the top five-year-old mare in the nation. She had dreams of rodeo competition and bought her Women’s Professional Rodeo Association permit in February of 2014. She entered rodeos within a day’s drive of her home and consistently picked up checks. Bling was eight years old and McDonald also wanted to give the mare a chance to win big. She and her friend Erica Norris were at the lake one day when Norris suggested they take off for the summer and rodeo. So with Norris by her side and Bling and Rose (her backup horse) in the trailer, they set off July 5, 2014 to make the nearly 2,000 mile journey to Casper, Wyo. This was the first time to compete at a rodeo “out west,” and actually the first for them west of the Mississippi. The change in altitude and environment didn’t faze either one of them. They got the last paycheck in the first round, came back and won the finals and finished second overall. That added up to $5,180. That was just the beginning. Prior to their adventure, McDonald had won just shy of $8,500. When the season ended she was the WPRA Rookie of the Year and 19th in the world standings with over $64,000. Her success has continued in 2015. She won every round at the Fort Worth Stock Show Rodeo last February with times of 16.42, 16.37 and 16.32, getting faster with every turn in the Will Rogers Memorial Coliseum. She was the big money winner there at $20,932. That gave her an early lead in the world standings. They are in second place as of May 1 and are enjoying time at home before their next trip “out west.” They will start the summer run the end of this month at Fort Smith, Ark. We will be following McDonald’s and Bling’s adventures as they pursue their first Wrangler NFR qualification, and we will be telling you more about the background of both of these athletes. Susan Kanode grew up on a ranch in northeast Colorado. Animals have always been part of her life and that sparked an early interest in rodeo. She loved watching the athletic abilities of the four-legged creatures and became a fan. While in College at Colorado State University she helped put together a media plan for their college rodeo. After graduation she moved to Dodge City, Kan., where she was an associate editor for the High Plains Journal. Her involvement with rodeo continued as she became heavily involved with the Dodge City Round-Up. That led to her full-time commitment that she has today. She started out working for the National Western Stock Show and Bad Company Rodeo, went on to work for national sponsors of the Professional Rodeo Cowboys Association and now is involved with many of their top rodeos as well as the College National Finals Rodeo. With over 30 years of being a rodeo fan and journalist she brings undeniable knowledge and perspective to the table. Susan tells everyone that asks that she has a “perfect life.” When she is not working at a rodeo, she can be found at her home in Paradise, Texas, or the family ranch in Ault, Colo., with her dog and two horses in tow. Follow her on Twitter @rodeowriter.